We're honored to accept these prestigious awards from PHD, of course. It's the kind of post we like best, our smiling faces, shaking hands and accepting fancy plaques. But truthfully, you might be asking why it matters. PHD and Optimax products are used in the food and beverage industries, blow molding, medical, packaging, dispensing, laundry, workholding, the equipment manufacturing sector, and more. Awards like these can't typically be attributed to just one success. Rather, they are result of projects with multiple customers, large and small, effectively transforming they way they produce their items. We work with products ranging from a few ounces to hundreds of pounds. The solutions not only need to work better, but also be cost-effective. In other words, we're working alongside our customers to improve their processes. The results are measurable, proven solutions. If you're one of those customers, we'd like to thank you! We could not have achieved these honors without you. If you haven't taken a look at all PHD has to offer, we'd appreciate the opportunity to stop in sometime and show you how PHD and FPE Automation can work for you. 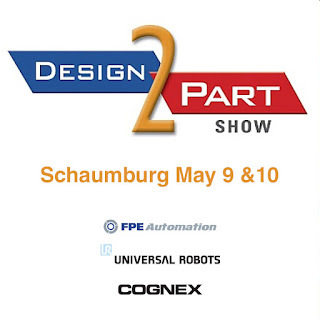 FPE Automation, Universal Robots and Cognex will be at D2P at the Schaumburg Convention Center May 9 & 10. D2P is the region's largest contract manufacturing trade show. Don't miss it! mHUB is a Chicago-based innovation center focused on physical product development. They are doing great things for local industry and economic growth. You can read more about mHUB and the cool things they do on their site. doing great things for local industry and economic growth. You can read more about mHUB and the cool things they do on their site. Join FPE and mHUB from 5:00-7:00 pm for the mHUB Open House: Industrial Robots event, with a collaborative robot demo featuring Universal Robots. 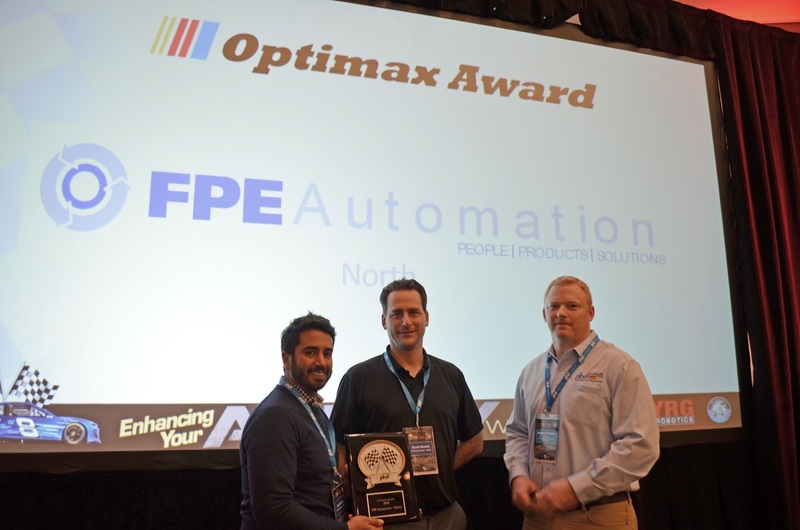 FPE Automation has been UR's partner in the greater St. Louis area and Eastern Missouri for years now. We have the experience to put cobots to work for you. 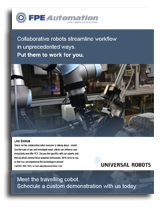 Schedule an on-site collaborative robot demo with our experts. Explore the ways you can increase productivity and profit by using the latest, hottest technology. Brand new, and already a proven concept. Introducing premium fixed-mount barcode readers. They're precision engineered for the most challenging applications. The very latest in imaging technology. 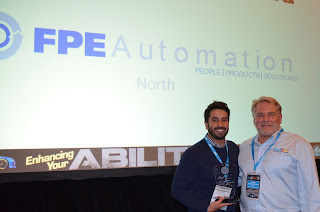 Here at FPE Automation, we're excited about this latest product release! 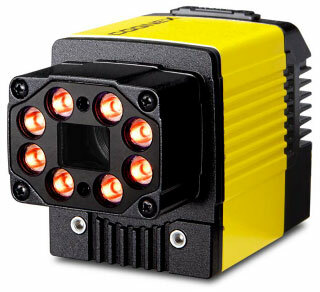 Our ACD team has already tested the newest Cognex Dataman 474 out in the field. The proof of concept reports are in. It has already succeeded where others have failed. Accuracy. Excellent Scores. Reading from a distance. Reaching a wide field of view. FPE Automation and Cognex bring the very latest to you during this valuable, hands-on seminar. We’ll cover leading edge vision sensor technology. You’ll leave with relevant knowledge you can leverage when you’re back on the job, for measurable results. What gets missed on your line? Defective parts? Bar codes? All you may be missing is Cognex vision and the right ID reader. Error-proof your applications with In-Sight 2000. Discover how easy it is to use powerful vision tools. Participants qualify for a one-day-only, substantial discount on a Cognex In-sight 2000-130 Mini, 6.2 mm liquid lens, standard white light, cables and brackets (lab kit). FPE Automation’s Danielle Krueger, together with top industry experts from Cognex, guide you through the process while you gain firsthand experience with the latest technology. FPE Automation welcomes Cognex back to our on-site training center for Invent Your Solution. Customers can attend free of charge. Limit one lab kit per organization. 10:00 am - 2:00 pm. Lunch will be served. One of our most entertaining events is back by popular demand! 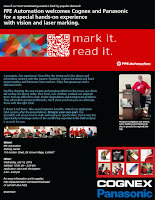 FPE Automation welcomes Cognex and Panasonic for a special hands-on experience with vision and laser marking. An energetic, fun experience! Spend the day immersed in live demos and informative sessions with the experts. Featuring Cognex handheld and fixed mount readers and Panasonic laser markers. Enjoy free giveaways and a delicious lunch. We’ll be skipping the easy targets and jumping right in to the issues our clients tell us they are facing today. Poor focus, low contrast, washed out originals. Items that are difficult to mark. Finder degradation and background problems. They all result in process bottlenecks. We’ll show you how you can eliminate those with the right tools. It doesn’t end there. Take away long-term benefits. Attend our application Q&A session after the presentations. Bring in your own part. Our specialists will assess how to mark and read your specific item. Don’t miss this opportunity to leverage some of the world’s top expertise in the field and put it to work for you. 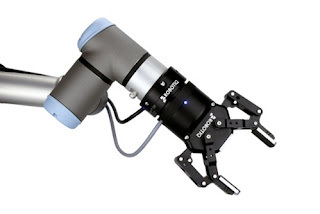 SCARA robots not fast enough to meet your automation needs? Check out the Yamaha YP-220BX pick and place robot in action (video below). It has a cycle time of 0.45 - 0.57 seconds. That's high speed. Need additional information or a quote? Contact us. FPE Automation is here to help! One of the best things about working at FPE Automation is the privilege of witnessing innovation in a wide variety of industries that touch our everyday lives in one way or another. In this video, our friends at Piab are working with a product that's tough to handle, unless you're snacking on it! Here's string cheese, from Piab. Enjoy!